I may not write, but I sure can knit. I knit constantly. Wes likes to drive, so I knit in the car. I knit while we watch tv. I knit when visiting friends. For 10 months my mother-in-law was in a nursing home and we visited nearly every night…I got lots of knitting done during those visits. 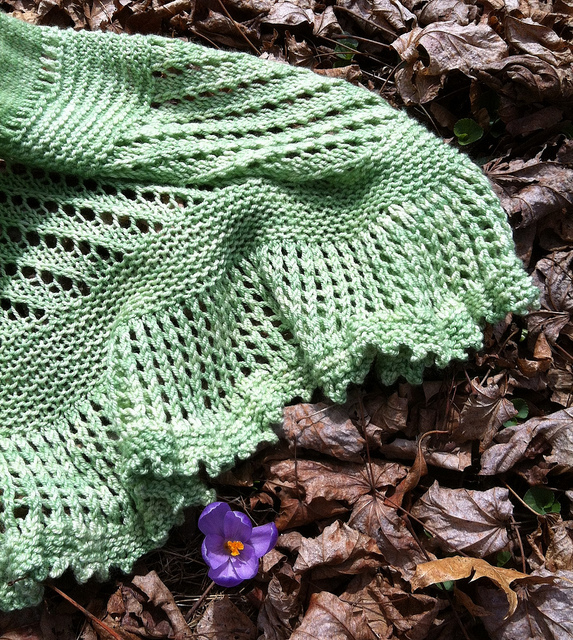 I also crochet, and I spin my own yarn – with an honest-to-goodness antique spinning wheel. I’m presently learning to dye my own yarn and I’d love to learn to weave. Most people show a bit of interest in all of this, but I can see on their faces that they truly don’t understand why I love it so much. I wish I had an answer. It’s kind of like an addiction. Instead of cocaine, it’s cashmere. Instead of alcohol; alpaca. Yarn is yummy. But when someone sees me making socks I can see the question on their faces: “Why?” Especially if they inquire… How long does a pair of socks take to make? About 20 hours, depending on the pattern. And the sock yarn isn’t cheap. 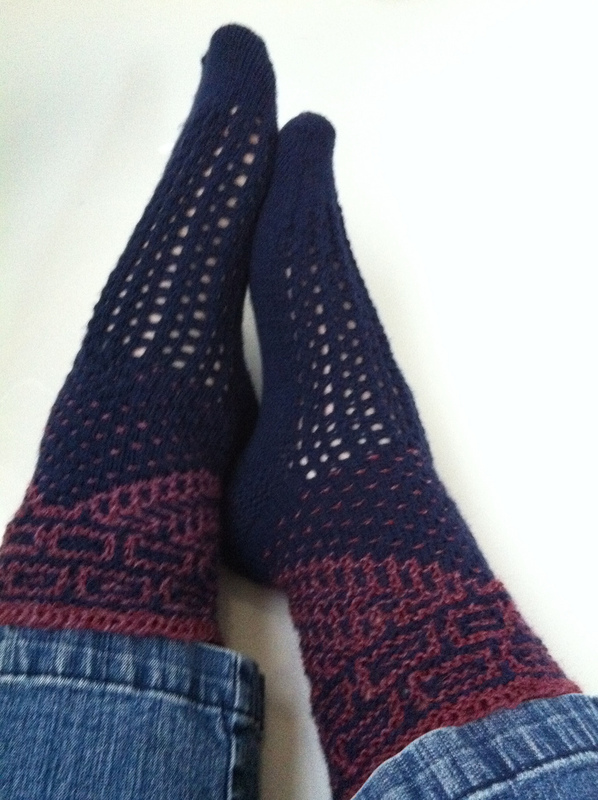 Its’ about $14-24 for good sock yarn, depending on the fibre. (But a wool/cashmere/silk blend sock is a luxury most people will never experience!) “That expensive?” they ask. They look at me in confusion. Sometimes their heads turn a bit like puppies do when they hear words that don’t make sense. My shoulders slump. Yes, I know I can buy socks for $3 at WalMart. That’s not the point! Everyone spends money on their hobbies. People who like sports spend money on tickets to watch their teams. They buy sports-related clothes at inflated prices. Other people play those sports and spend money on equipment or lessons. It’s the same thing. I don’t knit because I need socks. Or a scarf. Or a blanket. That’s just a wonderful benefit of the hobby. I knit because it’s fun. I love it! A skein of yarn is like a toy. A transformer. At first it’s squishy and smooshy. 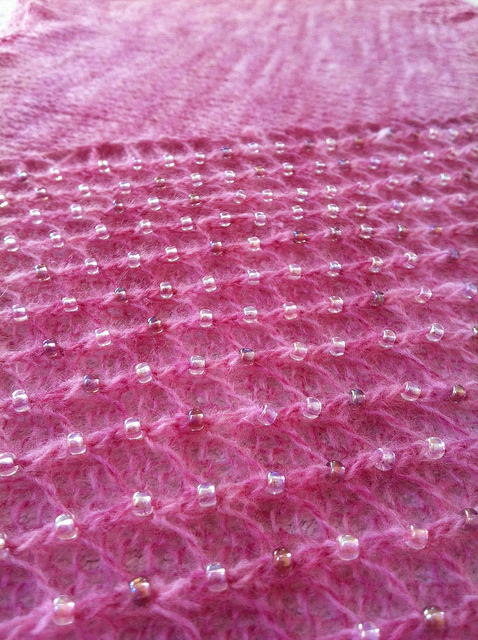 (Yes, smooshy is a very technical knitting term.) You can play with it. It’s full of potential. All the patterns battle in your brain to be the winner of that yarn! And YOU are the judge! You choose which path the yarn will follow. Sometimes the yarn rebels. It doesn’t want to be a scarf!! Not THAT scarf, anyway. And you may eventually agree with it and rip it out and start over. Letting it fill with potential again until the right pattern makes itself known. At this point, my non-knitting friends believe I have taken a few steps away from the Sanity Center. My knitting friends are just nodding. I LOVE that you knit and what you knit!!! She’s my wife, and I love her. iKnit2… and I know about 2,000,000 others who are right there with us, wandering away from Sanity Center.